There are many great campsites around the Atlanta area. A camping weekend is a great way to get a breath of fresh air away from the city. Camping near Atlanta, GA is also a smart way for tourists to see the city while minimizing the expenses of finding a place to sleep. Whether you are an Atlanta local looking to escape the city, or an Atlanta tourist planning to see the city, check out these campgrounds nearby Atlanta, GA! Stone Mountain Park has many camping options. Visitors can rent the tent sites, safari tent sites, RV sites and yurt sites. There are even RV rental sites available, for those that want to enjoy the pleasures of RV camping without having to own a RV. Stone Mountain Park has a large number of attractive amenities, including grills, free Wi-Fi and cable, a general store, swimming pool, playground and volleyball court. 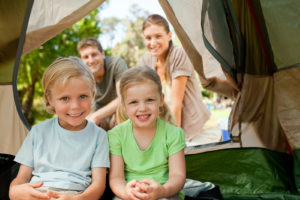 There are a variety of campground packages available, making camping at Stone Mountain Park an affordable family vacation. Sweetwater Creek State Park has both campsites and yurts available. Amenities in and around the campground include: boat rentals, canoeing, fishing, hikes and a nature overlook. Pickett’s Mill Battlefield State Historic Site is also near Sweetwater Creek State Park. Campsite reservations can be done online or by contacting the park. The Atlanta South RV Resort has more than just an RV campsite, it also has tent and cabin camping. This campsite has a pool, recreation room, playground and internet access. It also in conveniently located nearby Six Flags and Downtown Atlanta. The Beautiful Rock, RV and Music Park has tent camping, cabin camping and RV camping options. The tent and RV camping options have electric hook-up options for the convenience of visitors. This campsite is different from traditional campgrounds, and is also the home of Bluegrass festivals, events and weddings. The well-known “Silver Comet Trail” is a favorite of hikers and cyclists alike. Once your big camping trip is over, it is important to properly store your camping gear to keep it in the best shape possible for your next trip. If you’re looking for a location to store your camping gear, consider a storage unit. A climate controlled storage unit rental will maintain a steady temperature ideal for storing camping supplies. Storage World has storage facilities near Atlanta, GA, in Jonesboro, GA, Stockbridge, GA, Decatur, GA and Panthersville, GA. Our Jonesboro and Stockbridge storage facilities also have RV storage options. Stop by or contact one of our storage facilities today!